Despite my red hair, I'm not really all that Irish. A little, sure...but about as Irish as I get is drink some Murphy's and quote some Boondock Saints every once in a while. Or listen to some U2. I'm not the one who tried to come off all lepruachaun-y on the latest podcast episode, anyways. So, I'm not really sure how "bangers" is appropriate Irish verbiage meaning a sausage. And I'm not about to find out - after all, I'm typing this on my break at my work computer, and need to ensure I keep all Web searches HR friendly. Regardless, there's that big Irish holiday coming up where we all decide to get our green on, and so apt enough, Trader Joe's Irish Bangers are back on the shelves for this season. They're really only around this time of year as an alternative to corned beef for Irish meat intake. And it's too bad....because I really like these sausages. Pardon me, but these bangers are bangin'. Made simply from ground pork and spices and packed not too tightly, they're a perfectly delectable somewhat seasonal treat. Bangers and mash? Yes please! And that's exactly what we did last week one night for dinner, with enough left over for lunch the next day for me - happy Russ. They're not exactly perfect, though. 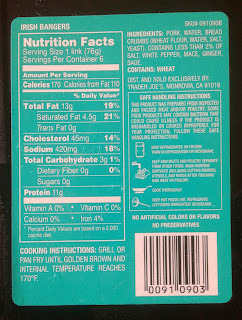 The pork flavor itself is fairly light, but at least in our last package, there was this - how I do say it - almost a sweetness to it not explained by the ingredient list. Red wine vinegar comes to mind for some reason, but that's not quite it. I don't think other times we've had the bangers I've noticed that, but I could be wrong. A little less of that, and a slight bit more pepper would have been great. Also, probably just like ones your Irish nana used to homemake, there were a couple small hard pebbles of gristle in one or two of mine. I can accept or homemade, but for commercially produced...c'mon. Our local TJ's was sampling the bangers over the weekend with some pickled sauerkraut and dijon mustard, though and man - that was a tasty combo. The pork was a perfect base and hold it's own in that triad of strong, hearty flavors. 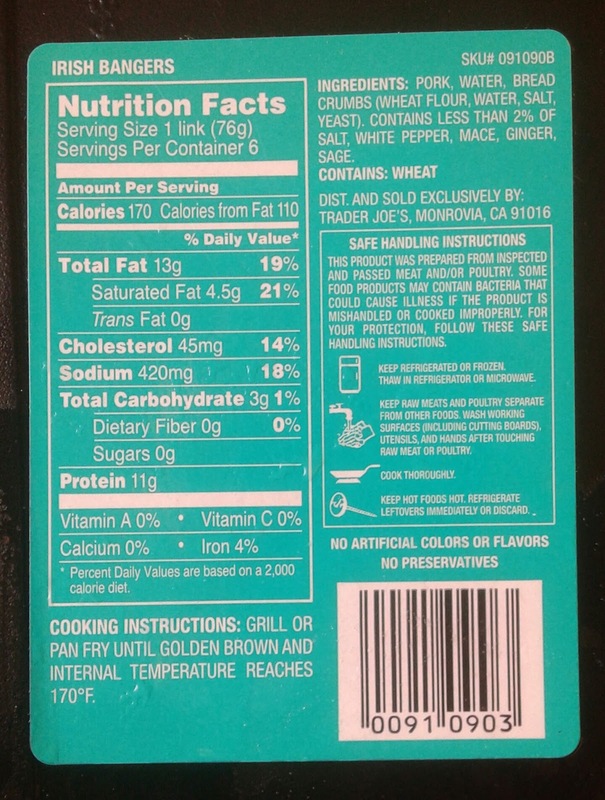 A pack of six runs only a few bucks and is well worth for firing up on the grill or broiling in the oven. My kiddos loved them and gobbled down without complaint, as did the wife and I. Get them while you can, and bonus points for no artificial green food coloring. Just like nutmeg will add an odd, sweet flavor to sausages, I would think it's the mace in these. Bangers are so-called because after the First World War there was little meat in sausages -- just scraps, cereal and water -- so they sizzled and spluttered a lot when they were frying. It sounded as if there were mini explosions, or bangs, going on, hence the name bangers.